Flight 191 left the gate at Chicago-O'Hare at 14:59 and taxied to runway 32R. At 15:02 the flight was cleared for takeoff. The takeoff roll was normal until just before rotation at which time sections of the No. 1 engine pylon structure came off the aircraft. During rotation the entire no. 1 engine and pylon separated from the aircraft, went over the top of the wing, and fell to the runway. Flight 191 lifted off about 6,000 feet down the runway, climbed out in a wings level attitude, and reached an altitude of about 300 feet agl with its wings still level. Shortly thereafter, the aircraft began to turn and roll to the left, the nose pitched down, and the aircraft began to descend. As it descended, it continued to roll left until the wings were past the vertical position. The DC-10 crashed in an open field and trailer park about 4,680 feet northwest of the departure end of runway 32R. The aircraft was demolished during the impact, explosion, and ground fire. Two persons on the ground were killed. PROBABLE CAUSE: "The asymmetrical stall and the ensuing roll of the aircraft because of the uncommanded retraction of the left wing outboard leading edge slats and the loss of stall warning and slat disagreement indication systems resulting from maintenance-induced damage leading to the separation of the no.1 engine and pylon assembly procedures which led to failure of the pylon structure. 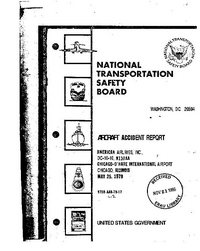 Contributing to the cause of the accident were the vulnerability of the design of the pylon attach points to maintenance damage; the vulnerability of the design of the leading edge slat system to the damage which produced asymmetry; deficiencies in FAA surveillance and reporting systems which failed to detect and prevent the use of improper maintenance procedures; deficiencies in the practices and communications among the operators, the manufacturer, and the FAA which failed to determine and disseminate the particulars regarding previous maintenance damage incidents; and the intolerance of prescribed operational procedures to this unique emergency." issued an Emergency Order of Suspension. The Order suspended the DC-10 series aircraft type certificate "until such time as it can be ascertained that the DC-10 aircraft meets the certification criteria of Part 25 of the FAR and is eligible for a Type Certificate." On June 26, 1979, the FAA issued Special Federal Aviation Regulation 40 which prohibited the "operation of any Model DC-10 aircraft within the airspace of the United States." On July 13, 1979, after a series of formal investigations, the Administrator found that the DC-10 met the requirements for issuance of a type certificate. Accordingly, the Emergency Order of Suspension was terminated. In November 1979 the FAA fined American Airlines $500,000 for using a faulty maintenance procedure on its DC-10 aircraft by using forklift trucks to mate the complete engine/pylon assembly with wing attachment points. Continental Airlines was fined $100,000 on a similar charge. Distance from Chicago-O'Hare International Airport, IL to Los Angeles International Airport, CA as the crow flies is 2783 km (1739 miles).